Is the American Express Platinum card worth the high sign-up fee? TL;DR: I usually take my own bangers. Why does travel “flexing” bother you so much? What does elitism in the Black travel community say about you? My boy Clinton & I at Peaches Records in Uptown New Orleans. My life in D.C. has been outta pocket lately, so it felt good to escape #thistown for a few days. This year's National Association of Black Journalists conference was in New Orleans, and I was determined not to miss it. I'd never been to New Orleans (save for a brief overnight stop en route to Las Vegas when I was eight) and I wanted to eat, drink, be merry and meet other dope journalists. NABJ this year was pretty cool. It got a lot of publicity for other reasons, but it's always great to see old heads that I admire, and young heads just starting out in the industry. This is my fourth year going to the conference and it's been amazing to watch the growth of myself and my crew over the years. When I got to New Orleans, I was worried about the weather situation. There were reports of heavy rain and flooding. The morning after I landed, it was raining pretty badly and I just hung out at the conference hotel all day. The next day, the weather cleared significantly and after spending some time networking and recruiting for work, I was ready to try the food scene. And baaaaby, let me tell you: I fell in love. That first day I had lobster macaroni and cheese. It was still boiling in the plate when the server set it on the table. It isn't an exaggeration when I say that it was so good that I wanted to cry. My homegirl remarked that she could taste the state of Maine in the lobster. It was that good. During my time in New Orleans, I tried to eat as much as my tiny stomach would hold. I have zero regrets. I had shrimp pasta, po' boys, and beignets. Shout out to Cafe du Monde, btw. They're open 24/7 and the beignets were super cheap. 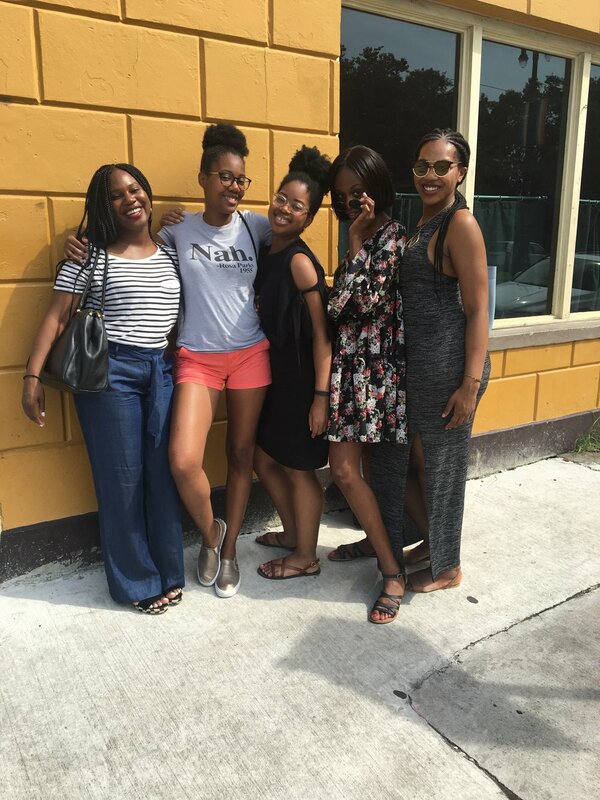 On Saturday my girls and I made our way to Meauxbar, where I had the best grits of my life – and I don't like grits. At all. My stance on grits has officially changed. The brunch was great – I had sausage and egg on a biscuit – and the bottomless mimosas were strong, with a kick. and decided to explore the area. New Orleans is a complex city. It's a city still healing from Hurricane Katrina, and it's undergoing aggressive gentrification in parts of the city, but the residents have so much pride for the city. I saw it from the time I landed at the airport until the time I departed for D.C. It's a city with good food, good music and good people. I heard brass bands, listened to some bounce music, and went to the record store that gave New Orleans legends like No Limit and Cash Money their start. My homegirl JQ said, "it's the northernmost Caribbean city," and I could feel it. It felt like my experience in Jamaica, or Havana, or Port-au-Prince. It was loud and colorful. It was warm and homey. A cab driver told me that New Orleans was unlike any city in the country. "It's like being in a whole different country," he told me. It was a welcome change from D.C., where politeness can be hit-or-miss. The southern hospitality reminded me of back home. My cab driver, on the way back to the airport told me, "everyone down here is like this." If that's the case, I'm sure I'll be back soon.